TICKET UPDATE as at 21/11/2014: The online and telephone box office has now closed for this concert. Tickets will, however, be available on the door on the night. The cathedral doors open at around 6:15pm on 22/11/2014. If you’re after a sonic event with dynamic richness, emotional impact, ceremonial grandeur, and one of Europe’s outstanding lyric tenors, then this is for you. 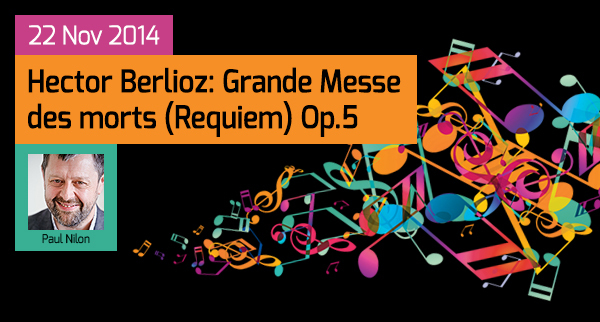 A rare opportunity to hear one of choral music’s most astounding spectacles. A choir of over 200 and the outrageously fine Philharmonia Orchestra with 16 timpani, 16 trumpets, 16 trombones, 2 tubas and 4 rather rare ophicleides. Submerge yourself in the splendour of this remarkable piece of music, and experience that magical quality that only a live performance can give you. If this is your first encounter – we envy you. Special Offer: Buy a ticket in the Front Nave & get one for the Christmas Oratorio for £20 (£10 under 16s). Both concerts must be booked at the same time. Keep up to date with the latest from GCS in con Spirito, our newsletter. We won’t share your details with anyone and you can unsubscribe at any time.